Moustokouloura, pronounced Moo-stoh_KOU_lou-rha, are Greek cookies made with either fresh grape must (moustos) or petimezi (grape molasses), which is concentrated grape juice. During autumn, when the grapes are ripe we can take the juice of the grapes and make theses cookies otherwise when there is no fresh juice, we make them with petimezi. I have talked about petimezi (peh-tee-MEH-zee) a previous post but for those of you who are reading this for the first time, petimezi is a natural sweetener made made from concentrated grape juice. One of its many uses in Greece is to make moustokouloura (grape must cookies). I’ve made these cookies many times and as I like to experimentm today I also added anthotyros, which is a whey cheese, similar to ricotta, in which I mixed some sugar, cinnamon and blossom water. If you do not add the cheese on top, the cookies are vegan. For these ones, I just placed a spoonful of the mixture in the baking tin, made an indent with my thumb and added a teaspoon of anthotyros on top. I am so glad I did add the cheese, as they turned out to be amazing! When made with fresh grape juice, their colour is light to dark brown, depending if you are using must from white or red grapes. The amount of sugar added will depend on how sweet the must is. Some times it is not even necessary to add any sugar at all. Therefore, taste the grape juice before adding sugar. In order to make them darker, you will have to used grape must from red grapes or add some petimezi and more spices. 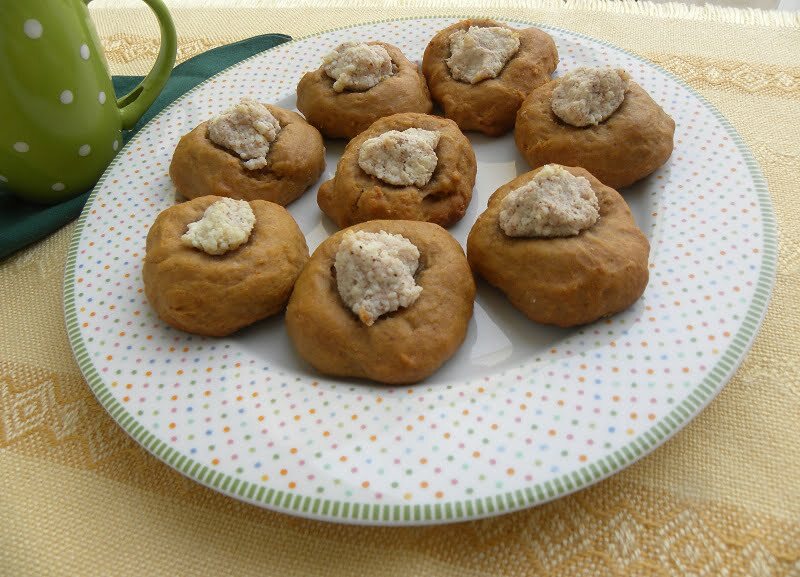 See my recipe for Moustokouloura with Commandaria, to get an idea. I am submitting this recipe to Loulou, who is hosting an event all about cheese, La Fête du Fromage. The post has been updated with new photos but I have left some of the older ones, so that you can see the difference. The first time I made this recipe was during Fall, many years ago. Then, I used fresh grape juice to make the cookies and added the cheese on top. A few days ago, I made the same recipe again but with a few minor changes. As there is no fresh grape juice this time of the year, I replaced the grape must and sugar with petimezi and some orange and madarin juice. These Moustokouloura cookies are not overly sweet but so delicious you just can’t eat only one. They are a bit crunchy on the outside but soft inside, like cake. Remember their sweetness will depend on the sweetness of the grape juice. If the grape juice is sour, you have to increase the amount of sugar. Taste and adjust to your liking. The same applies to those with petimezi. Petimezi is very sweet, so you will have to balance its sweetness with the amount of orange or mandarin juice added. Mix these two ingredients together and taste. Adjust by adding more petimezi to make them sweeter or more orange or mandarin juice to make them less sweet. If your oranges or mandarins are also very sweet, add some water to reach the desired sweetness. The extra virgin olive oil, together with the petimezi, citrus juice and spices pair together so well that they are irresistible! The flavour of the blossom water mixed in the cheese, is also absorbed in the cookie, making them very aromatic. They are perfect for breakfast or as a snack with some Greek Coffee or a cup of tea! Combine flour, baking powder, salt, spices and orange zest. In a large bowl add olive oil, sugar and grape must. Dissolve the baking soda in the brandy (or orange juice) (be careful as it will bubble) and add it to the other wet ingredients. Mix with a whisk to combine. Add the dry ingredients and mix until the dough is not sticky on in the bowl or your fingers. Take a spoonful of the dough (40 grams) and put it on the baking tin, spaced apart or shape them as you like. Form it into a ball and then make an indent in the centre. Combine the anthotyros cheese with the cinnamon, sugar and blossom water and mix to make a cheese spread. Fill each indentation with a teaspoonful of cheese. Bake for about 23 - 25 minutes depending on your oven. Store in an air-tight container upto 3 days. Great idea to add the anthotyro to the moustokouloura Ivy…I’m sure there are plenty of grapes leftover at this time of the year in Greece. Peter, do you get anthotyro in Australia and if so is it produced locally or do they make it locally? I believe it’s imported. The only “Greek style” cheeses they make here are feta (from goats and cows) and haloumi. and continuing…LOL…I rushed my answer! As you stated, it’s quite similar to ricotta but with a bit more “tang” to it. There are quite a fair few Italian cheese makers here making fresh ricotta on a daily basis. Ai Ivy! All your recipes are so mouth watering!!! I could have a good bunch of them :D.
Peter thanks for the information given. I hope they are not making halloumi out of cows’ milk because I know there are a lot of sheep in Australia. Brilliant idea! My family owns a vineyard and I really miss my grapes this time of year. I’ll have to do a list of dishes to make using fresh grape juice and include your cookies for my next visit to my parents. Thanks Lore. If you make them tell me if you liked them. wow! its a mouth watering recipe, Ivy! Great idea Ivy! Looks so great! The petimezi sounds really good and so does this recipe. Great flavors. Grape harvest is here. My new boss has a vineyard but for table grapes not wine grapes. Maybe I can look forward to some juice!! !